Last night we pulled into the parking lot at the Maltz Theater (Jupiter, FL) to see a spectacular production of Fiddler on the Roof. As we combed the lot for a parking space we came upon a van from Texas taking up two spaces. While it was wholly unusual to see a van make such a maneuver (it’s usually a high-end sports car owner who believes he has the right to park in such a manner), the people in my car (including me) did what any regular person would do upon seeing such a sight. We moaned and groaned and made several snide comments about Texas drivers and we took the parking space right next to them. We were early so we sat in the car for a few minutes before heading inside. That’s when I noticed the driver’s seat in the van – it was sideways. I mentioned it to the gang in the car and deduced that the driver was handicapped and had parked this way because there weren’t any more handicapped spaces available (this is southern Florida, dontcha know). Further, one of us spotted a small sign on the side of the van that no one could read because it was too dark. Suddenly I saw an older woman approach the van and slip a note under the driver’s side windshield wiper. She was in an animated conversation with someone out of my line of sight and I couldn’t quite hear what was being said other than, “I’m just going to leave a note.” My mind started whirling. Why would she leave a note, the van hadn’t been hit? A sinking feeling started to fill my soul. 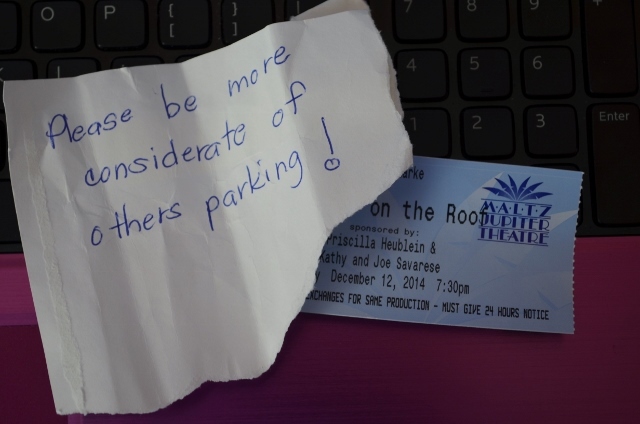 Please be more considerate of others(sic) parking! I was beside myself with the audacity of the woman. Had she taken one second to recognize the license plate, she wouldn’t have written such an insensitive note. One member of my party was reading aloud the sign on the side of the van that instructed anyone who cared to read it that they needed 10-feet of clearance on that side of the van. I folded the note and jammed it in my pocket as an older man came around the vehicle grousing loudly about the parking job and making some awful speculative statements about the driver of the van. “It’s a handicapped vehicle.” I stated calmly, assuming my answer would squelch the man’s resentment. “Perhaps there weren’t any spaces left.” I said, a little bewildered that my answer hadn’t achieved the expected result. To say I was stunned would have put it too lightly. I was horrified. “Nice attitude.” I yelled back at him, “and Merry Christmas!” Not one of my finer moments, but I couldn’t believe the lack of compassion from the people who had witnessed the van that took up two spaces. It didn’t end there. As my party joined the throngs of theatergoers moving toward the entrance numerous parties were grumbling about the van. My head down, I wondered where our manners had gone. Were we no longer kind and caring and empathic as a nation? I looked around at all of them … walking on two good legs and two good feet and perhaps had to walk a few extra yards because a van took up two spaces. Never was I so saddened by humanity.